Hi ladies and gents, I thought I’d share with you all some insights into my mind, now that I have had time to let everything from our inaugural weekend marinate just a bit. I truly do believe that a ton went super well in our first ever events, while also recognizing some things I dropped the ball on and can definitely improve before we go back at it. I entered the creation-of-PIFT-journey knowing “these first events I will learn what I know, and quickly realize what I didn’t know I didn’t know about operating a poker tour,” and can say by the end of Sunday night, it definitely rang true. To read “Part 1: The Good,” click here. The structure of the tournament was ultimately met with mixed reviews. There was a noticeable correlation in that generally, the people who busted early or became a short stack early on thought the structure moved way too quickly, compared to players who lasted deeper in the tournament generally felt happy with how much play the structure allotted them. I’d acknowledge that I myself, while covering the event, felt like things moved just a little too quickly – especially in the $450 buy in. For that one, I had envisioned cracking the money about 6-7 hours in, final table by hour 8 or 9, and tourney completed in 10-12 hours. What we got was the money being reached 5 hours in, final table 6 hours in, and the tourney completed by the end of hour 8. With the way this event ran, about 1/3rd of the run time was accounted for during the final table – which while a cool thing in some regards, was also ultimately more time than I’d have envisioned being my optimal final table percent-run-time when trying to chart out the tournament run-time beforehand. This structure that was used for the PIFT events was completely on me. I showed Canterbury some ideas, and they suggested some tweaks that might better serve the goals of my tour as a one day “doesn’t take 15 hours” type of event – but ultimately, I had the final say on all aspects of what was used. Seeing everything in action, I will strongly consider any combination of: 30 minute levels the entire way through, and/or some additional starting chips (compared to 10,000 which was started with in both). I will also add though that I had many people tell me the one-dayness of PIFT and the fact the tournament seemed like it wasn’t going to take all day, was in fact a drawing point that made them want to play. In specific, one guy who drove from Wisconsin, 2-3 hours away, told me that he loved he could play the Sunday event and know that even if he won it, he’d have more than enough time to drive back home and make it to bed at a somewhat reasonable time. So for me, it will definitely be a balancing act and trying to decide who I am most trying to cater towards, being that a majority of the gripes I heard about the structure came from people I know to be serious players, and/or professional players. More of the players who I presume identify as recreational or casual players, seemed to love the fact they could play a cool, fun tournament, that might produce a large prize pool, and still be home in time to catch an evening movie. Another way that I feel like I failed was I didn’t do a good enough job spreading the word about my new tour when in person at Canterbury. I was trying to be real cognizant of the fact I didn’t want to come off as spammy, or make anyone who knew me feel guilt if they couldn’t or didn’t want to play the event, so I generally just didn’t speak about the tour unless asked about it. I think I failed in this way, and should’ve been a lot more vocal than I was. This became especially apparent on the day of, when I had several people tell me, “Oh wow, I didn’t even realize this PIFT thing was all you, I’d have totally cleared my schedule to play it if I knew it was your thing” (INCLUDING a player I regularly play the $40/80 mix game with at Canterbury). I dropped the ball there, and this likely had an effect on what the final turn out numbers were compared to what they could’ve been. 82 players for a 1030am Saturday $450, and 90 players for a 1pm Sunday $185 is nothing to sneeze at — and I AM proud of those numbers, as a guy who entered this having no clue how to throw a poker tour, how to market it, how to run a business, etc. — but I’d be lying if I said I didn’t hope we’d crack 100 players in each of the events. I think the weather being 75 and sunny (in a state that could be 3-4 weeks away from frost! ), as well as it being opening weekend of the NFL and kids freshly being back in school with their first weekend off, were things we were fighting against from the beginning and likely reduced what type of turn out PIFT got in round 1, but I think I should shoulder some of the blame as well for failing to reach 100 players in either event. I’m definitely going to do more reaching out to the community and trying to spread the word and excitement in many different ways before it’s time to jump back into the ring – I feel like twitter was the only area I excelled at promoting what PIFT is about. I also think I need to continue to tweak the payouts chart. I have to admit I was slightly embarrassed when I saw the min-cash payouts for the $185 displaying $195, and going forward I would like all min-cashes to be closer to at least 1.5x the buy in amount. I had tested my chart pretty fully for all possible scenarios for the $450 payouts, but didn’t do so with the $185. For me, the solution of this is to produce a new payout chart that has a smaller range of player numbers in the gap before the next payout level. For example, in the current chart, one payout level is for 70-89 players, and the next is 90-109 players (and with the $185 getting exactly 90 players, that’s how we ended up with a $195 min cash). With a goal of always paying out at least 15% of the players, I might need to simply create separate payouts for if there’s 70-79 players, 80-89, 90-99, etc. That way, we’re constantly ensuring the percent of people getting paid out doesn’t balloon substantially above 15%, thus ensuring that a mincash offers a profit of larger than an extra value meal. These are some of the most pressing things I’m going to take a close look at before our next PIFT events happen. Continue onto Part 3 of this 3 part retrospective, where I’m looking for your feedback on a few things and just in general talk about some PIFT stuff going forward. I was unsure of what to expect with the “Winners Shown” format. In my opinion, it went off virtually flawlessly. The feedback I received was almost unanimously positive, players truly seemed more engaged in the hands that were being played when they weren’t also in the pots (seeing as the payoff of gained information was guaranteed every single hand), and by all indications both from my own observation as well as player feedback, technology use was substantially lower than the typical tournament. This was exactly the kind of atmosphere and friendly, inviting player environment that I’m hoping becomes a trademark of PIFT events, and it went better than my wildest expectations. Moreover, I was worried there might be issues with a player or players repeatedly forgetting to show their cards, and likewise the dealers forgetting to make them show if they did muck their cards. Fortunately, this issue was a non-concern, and players almost always remembered, and the rare times someone forgot to, usually another player at the table was able to gently remind them – and also, Canterbury’s dealers are top notch excellent and they did a great job of remembering to expose the cards in the few instances a player forgot. I get that accidents happen, habits are hard to break, and nobody is perfect – and given that, “Winners Shown” operated almost perfectly. Some of the feedback I received was also real cool. For example, when one of the top 5 finishers in one of the events (who traveled over 2 hours to come play PIFT) was asked what feedback he could give me to improve on in future PIFT events, or any other general feedback, he replied “absolutely nothing. I love everything about this and would definitely come back to play more PIFT events.” We then continued talking and he asked me when the next Poker Is Fun Tour event will be, and I told him something like, “I’m not sure yet, I don’t have anything on the calendar. My wife and I are having a baby in November, so I’m probably just going to take it easy for a few months as I learn what challenges await us with our first baby.” He then replied to me jokingly, “That would be my criticism then. You need to have PIFT events all the time!” It felt super awesome to get some validation that this vision I’ve had in my head for a long time, became a reality in a way that it connected with some of my customers to the same level of enthusiasm I have for it. Also, nobody who reached the final table had anything bad to say about the final table clock roll-back feature of PIFT. In the $450, we rolled the clock back from 26 minutes left in level 13 (1000/2000, 300 ante) to the beginning of level 12 (800/1600, 200 ante), which ended up being a full 56 minute roll back. The average chip stack at this point, with 10 players left, was 82,000, meaning we had over 50 big blinds as the average chip stack at the start of the final table. One of my aims of the tour was to offer a lot of play when the most money is on the line – and in that respect, I think I succeeded in flying colors. A 50 big blind average chip stack at a final table of these price points, or even most $1,000’s out there, is relatively unheard of. Plus, just to throw it in, I’m pleased with us raising just about $2,500 for Second Harvest Heartland. When I created PIFT, I had no clue what type of support I might be able to acquire from local businesses, and I’m thrilled at what the final charitable output was from PIFT’s opening weekend. My original expectations were in the $1000-$2000 range, so clearing that makes me ecstatic. Finally, overall I feel like as a one man crew, I did a great job keeping up with “live updates” while the tourneys were running. From the start of Saturday morning, to the end of Sunday, I really evolved in efficiency as I quickly discovered lots of tricks and short cuts in note taking and updating that helped me continually get new posts up. That isn’t to say I did a perfect job, but given that I was doing them all myself, in addition to photographs, in addition to being present to interact with people as they had questions, comments, or just simply wanted to talk for a few minutes, I think I did a real good job. It was fun getting to dust off my journalism degree I got over 10 years ago, and put it to use for a few days – albeit with some rustiness. 5) Even hands you aren’t in will be exciting to follow! It’s hard to like a movie without knowing its ending – this weekend, every hand is its own movie and every hand has an ending. 4) The players who will benefit the most will be the players who are paying attention. Yes, you will have to “show,” however, the other players at the table also have to show. Now anyone deeply engrossed in an iPad movie loses out on all that info! 2) Learn while you play! It might be surprising how frequently or infrequently a bad hand or a bluff takes down the pot. Moreover, as habitual bluffers or nut-peddlers get exposed, watch the game evolve into a high stakes version of rock-paper-scissors — while you guess if your predictable opponent keeps firing rock, or changes it up with some new moves. 1) What’s better than bluffing a friend, enemy, or anywhere in between – and then being able to show them? Without showing them being seen as needling? Nothing. Don’t miss out, our inaugural weekend is going to be big! Check out the event page by clicking here. PIFT is excited to announce that our charity reach for our first ever tournaments will be stretched even further than just 1% of the prize pool! Good Day Cafe has graciously offered to do a 100% charity match, up to $1000 for our “Winners Shown” events at Canterbury Park on September 9th and September 10th. Additionally, they have also offered up three $100 gift cards that we will be giving away: two bubble players in our $450 Saturday tournament, and one to our Sunday $180 bubble player. It’s our goal to find a few other amazing local businesses to join our “Charity Pledge Partner” program — we are looking for businesses of any size to agree to pledge a 10% charity match up to $100, 50% match up to $500, or 100% match up to $1000. So if you own or happen to be real close to anyone who might have a business that would be a good fit to join our pledge program, please drop us a line by emailing schneids at piftpoker.com or using our Contact Us page. All businesses that agree to pledge a charity match of any level will be given some free exposure on our website and social media accounts, as well as will receive the original copy of the charity receipt so they are the ones benefiting from the charity write-off. Any and all pledge of any size is a good pledge, so please, if you’re a business owner who enjoys poker, please consider joining us in our mission of bridging together the local community with our fun game of poker in a way that benefits those who need it the most. http://www.piftpoker.com/wp-content/uploads/2017/04/pift-logo.png 0 0 Schneids http://www.piftpoker.com/wp-content/uploads/2017/04/pift-logo.png Schneids2017-08-03 15:33:162017-08-03 16:02:02Announcing our first ever "Charity Pledge Partner"
Just as it sounds – if you are the last remaining person in the pot, you must show your cards in order to be given the pot. AKA the “sleep well at night” tournament. All your bluffs will be known! All your nut peddling will be seen. Now you never need to ask, “If I fold, will you show?” This rule will drastically change the dynamic of the game and certainly create more action and battle of wits as you anticipate and predict if your opponent has it in him or her to try bluffing a third straight time! Tip: Don’t be shy about holding onto your cards until you are certain everyone else has folded! You don’t want to accidentally expose your hand when there’s still another player in the pot. Likewise, if you know you are going to fold in a key pot and you’re desperately curious to ensure your opponent doesn’t forget to show, don’t be scared to give him or her a reminder before you muck your cards. Event 1: Saturday, September 9, 10:30am start, $450 buy in. Event 2: Sunday, September 10, 1pm start, $180+$5 buy in. Satellite Qualifier: Friday, September 8, 5pm start, $110 buy in (top 20% win $400 in tournament lammers and $50 cash to be used on Event #1 on Saturday). 15%+ of the field gets paid. Both events are one day tournaments. Once the final table is reached, we bump the clock back to the beginning of the previous blind level (this means moving back a level in the blinds!). Get MORE play when the money is most on the line. 1 entry and up to 2 re-entries in each event. Re-entries and late entries can occur up through the end of the 2nd break (roughly 3 hours after the tournament begins). 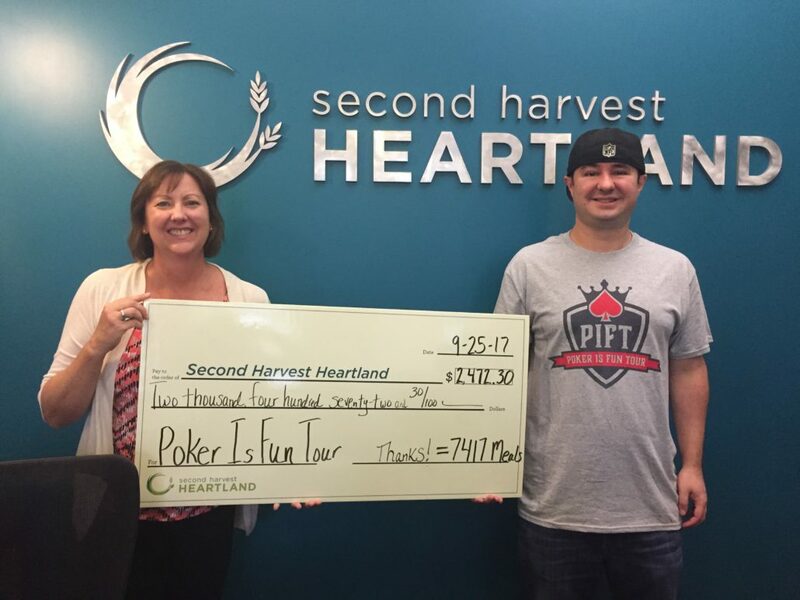 1% of prize pool withheld for donation to Second Harvest Heartland. See Poker For Good to read why we believe in 1% going to charity. Deals are allowed to be made if all remaining players agree.